Controversy, recriminations, and managerial departures--the Serie A season ended in typical fashion in Italy. As the minutes wound down in the Stadio Franchi carapace--more hollow than usual because of the almost completely empty seats--Milan looked set for a dispiriting defeat to a Siena team that was already relegated. The last Champions Leage spot was increasingly looking purple, as Fiorentina were busy carving up Pescara. They were cruising at 5-1; Milan sinking under the weight of one solitary strike delivered by Claudio Terzi in the first half, when the Milan defence froze to allow him to glide in and score a simple header. Eighty-four minutes had gone, and Adriano Galliani's jowls hadn't even twitched once in the stands. He sat there more lugubrious than Vicente Del Bosque, flanked by the ubiquitous pair of Ariedo Braida and his son. To put it mildly, it didn't look good. CaptainMassimo Ambrosini had been sent off, Milan had come close thrice--once with Mario Balotelli crashing a header off the crossbar--but hadn't scored, and the midfield looked like they were allergic to passing. Then, the intervention in the 83rd minute. For the rest of the Serie A, especially Fiorentina, there was nothing divine about it--it was a secular intervention of wickedness. Referee Mauro Bergonzi saw a forceful enough tug on Balotelli and awarded a penalty. With Balotelli, penalties are a foregone conclusion (he hasn't missed one for Milan or in his career), and it was 1-1 with about ten minutes left (with injury time). Three minutes later, Milan floated in a free-kick, and Philippe Mexes prodded it against the goalkeeper, and prodded again past him. It was 2-1. 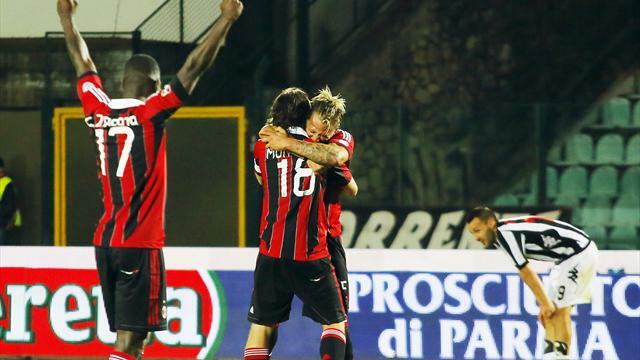 There was delirium in the Milan camp, as Galliani finally celebrated with the usual abandon. The penalty, of course, was velvet-soft. As the thin crowd chanted "ladri, ladri" ("thieves, thieves") in the stadium, you could sense what was to come. Fiorentina defender Manuel Pasqual frankly said that Milan were "gifted" the penalty, while Gonzalo Rodriguez affirmed his simmering outrage by not affirming it: "if I say what I am thinking, I will not play in Italy again." The credit and some of the discredit for that goes to coach Massimiliano Allegri. Those who clamour for his dismissal--including the less-than-cerebral owner Silvio Berlusconi--would be advised to think how far he has brought a team that saw the departure of Zlatan Ibrahimovic and Thiago Silva amongst a host of other players who either retired or left Milan after several years. Even in Allegri's championship-winning season of 2010-11, Milan pandered to the neutral's taste for drama far more than they needed to. They let Inter get perilously close to them, before winning in a direct encounter, a game that saw them surge four points ahead at a decisive stage of the season. Last season, Milan let Juventus surpass them right near the end, capitulating to a 1-1 draw to Fiorentina when a win was their only option. And, of course, this season, let's not forget Milan redeemed themselves after an understandably tumultuous start, and they were, at one point, a mere point away from Napoli in second, and quite comfortable in front of Fiorentina. That they needed a dubious penalty, and Mexes's toe-poke to get to the preliminaries of the Champions League hints at a lack of mettle when it was required most. Milan desperately need one who is able to deputize for, or even play with, Riccardo Montolivo, one current Rossonero who can actually distribute in midfield. And in defence, though Ignazio Abate has been enterprising as ever on the right flank, Milan need someone who can actually cross. Further, as Galliani has indicated, Milan's need for a central defender is also urgent, someone who can add to the fairly impregnable duo of Mexes and Cristian Zapata. Lots of questions ahead during the summer, and it will be intriguing to see how, or if, Milan honour their commitment to bring in youth and important players for Milan. There has been lots of talk of a fiscal revolution that allows for purchases, and no more painful sacrifices of players being sold--let's see how genuine it is.